The players at the top hold strong in our Rookie Rankings after Round 3, while two flying wingers join the top 10 after big performances. A quieter performance by Dylan Brown in Round 3 but he keeps top spot in the rankings after another solid effort. The five-eighth was targeted again in defence by a big Roosters pack but held his own, making 20 tackles and missing just two. He added 113 kick metres from four kicks and forced a drop out in a game where the Eels took it to the premiers for the first 40 minutes. A down week to what he’s produced in 2019 so far, Briton Nikora was still a presence for the Sharks on their right edge and scored a try that kick started their big win over the Cowboys. Trailing by four points shortly after the break, he chased through a Shaun Johnson grubber and put it down centimetres from the dead ball line. The try gave Cronulla the ascendancy, running in four more tries in the following 20 minutes. Maika Sivo jumps two spots in the rankings after a standout display in his side’s loss to the Roosters. The rampaging winger scored his first two NRL tries, the second with a brilliant show of strength, bumping off Matt Ikuvalu and carrying Joseph Manu over to score. On top of his try scoring feats, he ran for 137 metres and broke a whopping 10 tackles. Tom Flegler didn’t reach the heights of his previous game in Round 3, but it’s hard for any forward to back up a 196 metre performance, let alone a rookie 19-year old. He still got through a lot of work in just 24 minutes, running for 76 metres and making 12 tackles without a miss. The Sharks pack ran wild on the Cowboys in the second half of Saturday’s game and Jack Williams did his part off the bench. In 44 minutes, he ran for 94 metres and broke 3 tackles, lifting him up two spots on our rankings. Williams now averages 73 metres a game, with a 90.7% tackling efficiency. Corey Horsburgh makes a big jump in our rankings after a strong showing off the bench in Canberra’s seven point win over Newcastle. In 31 minutes, he ran for over 100 metres for the first time in his NRL career and added 17 tackles, with just one miss. Thomas Mikaele played just 24 minutes in Round 3, the lowest of the season for him so far, as the Tigers were blown away by the Bulldogs. Mikaele’s running numbers were down on previous weeks, with his side’s forward pack on the back foot for most of the game. Made to do a lot of defensive work, he made 18 tackles with just one miss. 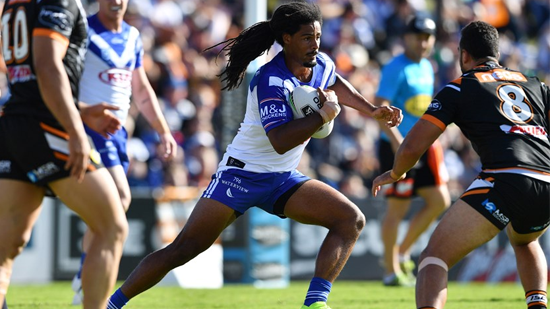 Canterbury winger Jayden Okunbor did not look out of place in the NRL with a very impressive debut in his side’s first win of 2019. The Milperra Colts junior was a force for the Dogs, running for 214 metres, the most of any player on the field. If Okunbor can keep performing like this, he’ll be flying up our rankings before long. It was a night to remember for the Brailey family on Saturday. In a massive Sharks’ win, Blayke scored his first NRL try and got to play with his older brother Jayden for the first time. The brothers played together for the final 12 minutes of their side’s win, with Jayden on the field when Blayke crossed the line. St George Illawarra’s flying Fijian winger Mikaele Ravalawa scored his first NRL try in their one-point win over the Broncos and jumps into our top 10. After a shaky game against South Sydney in Round 2, Ravalawa bounced back with 149 running metres and 4 tackle breaks. Reuben Garrick scored his first NRL try in Manly’s massive win over the Warriors in Christchurch. He also ran for 119 metres and broke 6 tackles. Melbourne’s Marion Seve had a 14-minute stint in his side’s big win over Penrith and scored a stunning solo try, bursting right through the Panthers’ forward pack to score. Another first time try scorer in Round 3 was South Sydney’s Corey Allan, who came into the side after Greg Inglis was ruled out. He also added 91 metres from 11 runs.